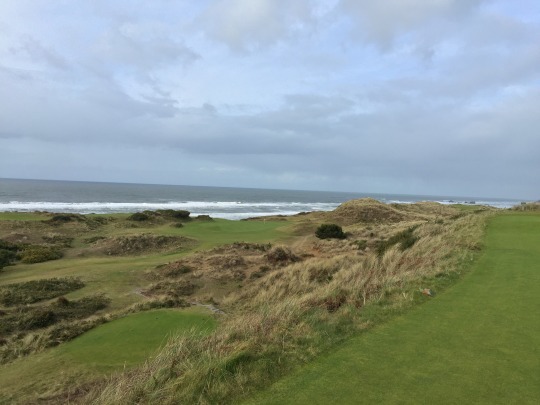 I’m going to go a little out of order with my reviews, so I can group a few other courses together and focus this post on one of the top-rated courses in the world. 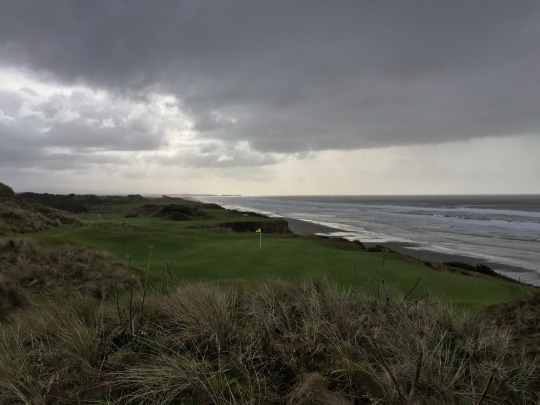 Whether you agree or disagree with Golf Magazine’s bi-annual “Top 100 You Can Play” list that ranks Pacific Dunes #1 in the country, it can’t be denied that this is a special course that deserves attention. 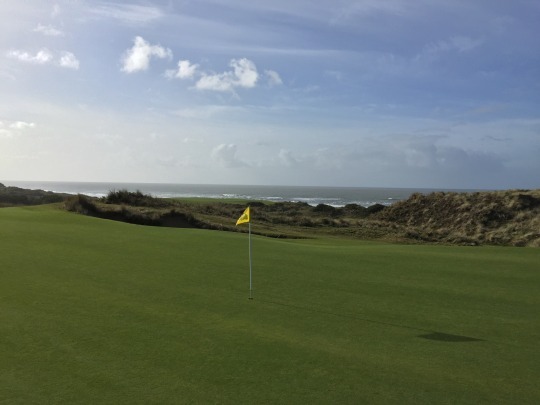 The same can be said for everything at the Bandon Dunes Golf Resort, though. I wasn’t even intending to play Pacific on Sunday, but the odds were ever in my favor and I took advantage of good timing. 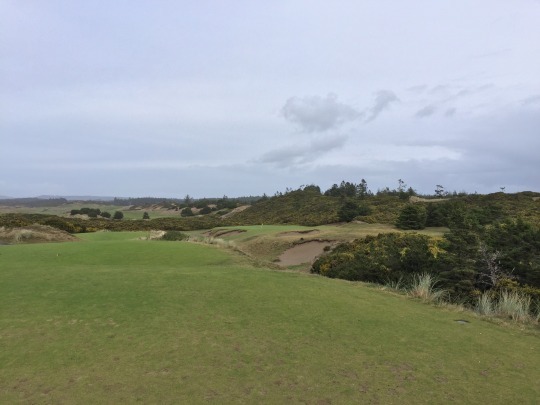 I actually went up to Bandon Dunes to take care of the “odds and ends” there. 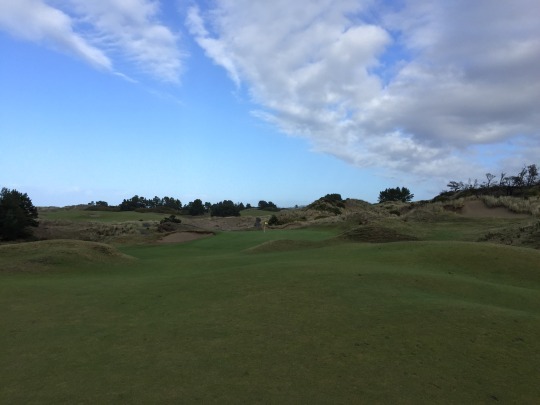 In the morning, I played The Punchbowl putting course, Shorty’s 9-hole par-3 course and the magnificent Bandon Preserve 13-hole par-3 course. I’ll review those in a separate “Short Course Blitz” post later this week after I take care of some other unfinished business in that area. The weather was downright nasty when I arrived in the morning. It was cold, windy and raining. People were out at the resort to play, but the conditions definitely scared others away. 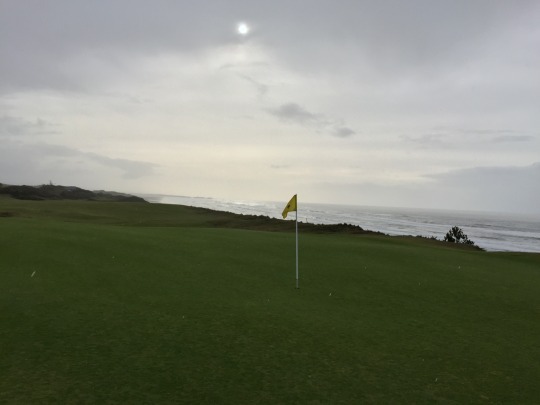 By the time I finished on Bandon Preserve, the sun had come out and things calmed down dramatically. It was also just after 11:00, so I had plenty of time to work with. 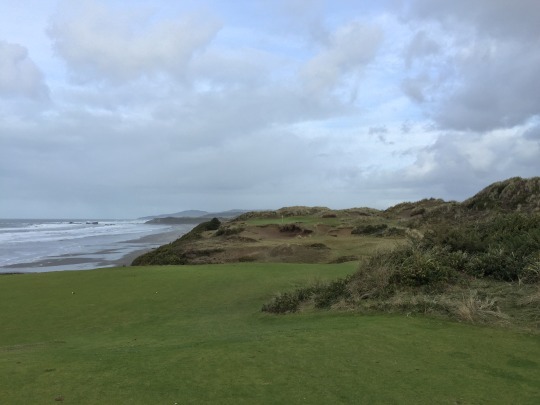 Pacific Dunes is the course I’ve wanted to come back and play most of the main four at the resort. I played it not too long after it opened and I really liked it. I headed over to the Pacific pro shop and they said I could head out any time. It was not crowded at all. I paid the $100 non-resident, non-resort-guest winter rate, which is not too bad for walking on at such a top-shelf course. I saw groups on the back nine while I was on the front, but I never caught anyone, so I enjoyed my own pace of play and basically had the place to myself. 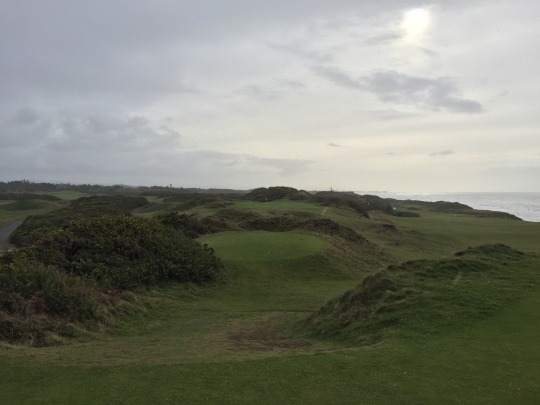 The weather changed about every 10-15 minutes and I got a little of everything throughout my round, but that’s kind of part of the Bandon experience. 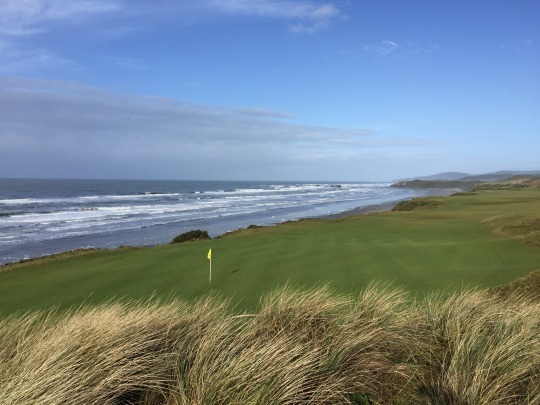 Pacific Dunes was designed by Tom Doak and was the second course to open at the resort behind the original Bandon Dunes course. The layout is fun and challenging—at times a bit crazy—and the scenery along the oceanfront is excellent. 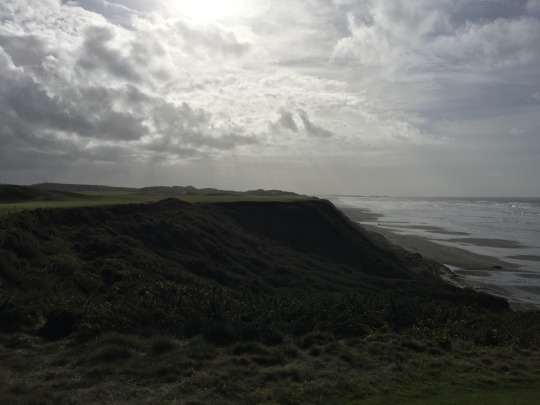 Several holes run right along the bluffs while some others inland offer some elevated views to enjoy. For a newer course, it’s not overly long at 6,633 from the tips and a par of 71. I played the green tees, which are the next set up and are 6,142. 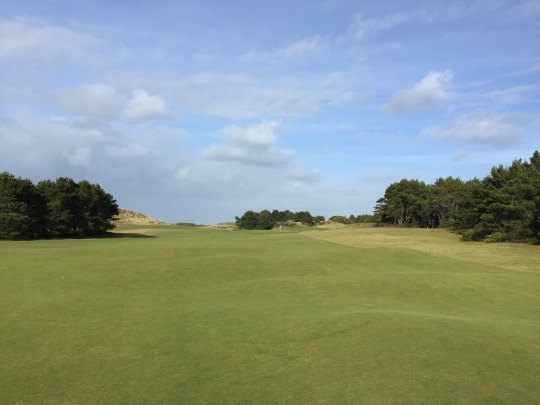 From the green tees, there are several rather long holes like 4, 7 and 18, but then those are balanced out with a few short holes like 1, 2, 6 and 16 (all of which are trickier than you think they will be). The 6th stands out as a really short par-4 that is drivable for some players. However, it may be the toughest green complex I’ve ever played. The green is severely elevated and very narrow from left to right. On the left is one of the scariest bunkers you’ll ever lay eyes upon. On the right is an equally steep dropoff that is a magnet for those a bit afraid of that bunker. I thought I hit a nice and safe wedge approach well left of the pin, but somehow it ended up going off that shelf on the right. Unfortunately, I didn’t see how that happened because it’s basically a blind approach up that hill, but if that shot didn’t hold I don’t know what else I could do here. This hole still baffles me. 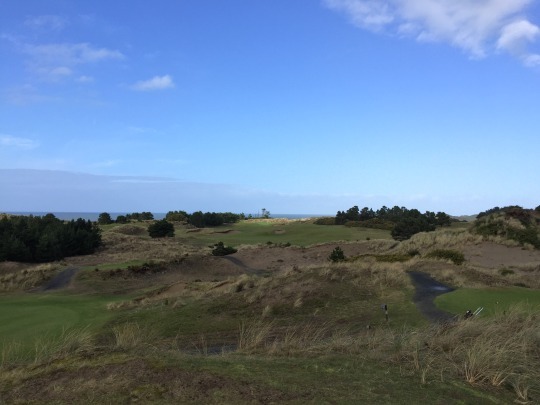 Otherwise, Pacific Dunes doesn’t always seem fair on and around the greens, but it is not as bad as it looks on most holes. There are plenty of bail-out areas and the greens are so big it’s not that hard to find the putting surfaces. The fairways are very wide open. There are some ugly bunkers you need to avoid, but they aren’t that difficult to steer clear of. 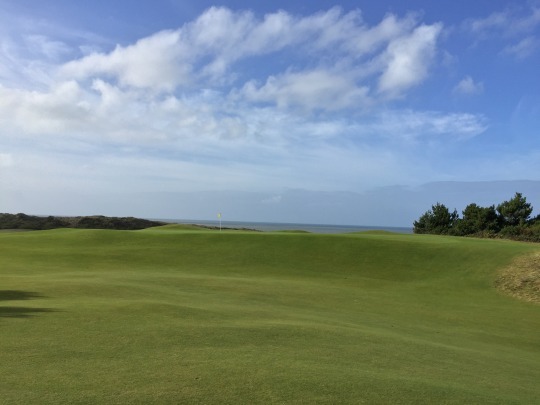 You can expect to have a few blow-up holes here, but good scores can also be had if you play smart and can make some putts on these tricky greens. Pacific has five par-3s in its layout and the routing is rather unusual with only two par-4s on the back nine. In fact, four of the five par-3s are on the back along with three of the four par-5s. Doak worked with what the land gave him, and though that set up is a little quirky, it works. 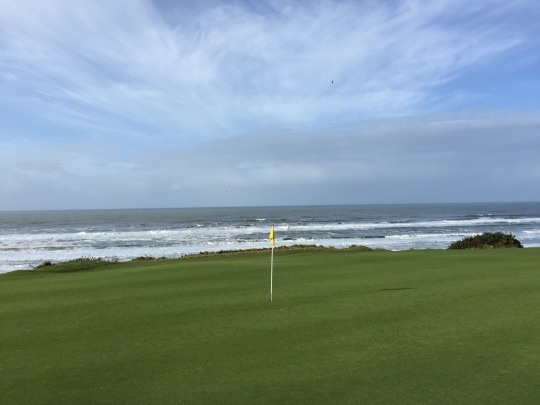 What helps is that holes 10 and 11 are a spectacular set of back-to-back par-3s near the oceanfront. 17 is also a nice hole that’s more inland. The 9th hole has two different greens, so they alternate between the upper and lower one. It was on the lower one Sunday, which makes the hole a little longer, but much less intimidating than the upper green that is very well-protected. Likewise, the 10th has two different tee boxes. 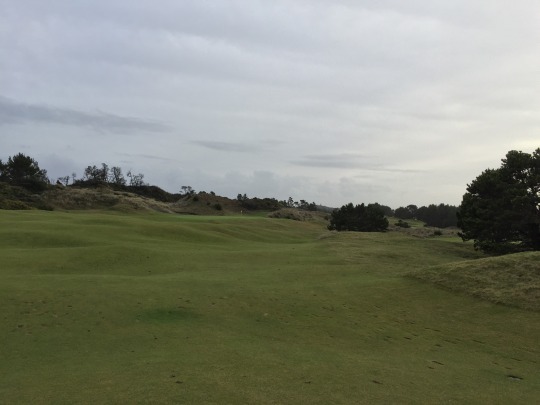 The upper tee is the one you want, as it’s a shorter hole and it’s probably the best view on the entire course with good elevation looking down toward the hole. The lower tees play longer and you don’t have the distance help (or the views) that the elevated upper tee provides. 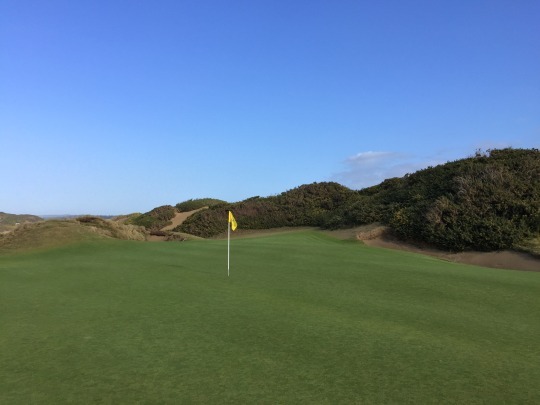 However you play the 10th, you’ll follow it up with the 11th, which is right on the edge of the bluff. The green is slightly uphill from the tee and there is nothing but nastiness in between you and the green. Long is definitely better than short here. 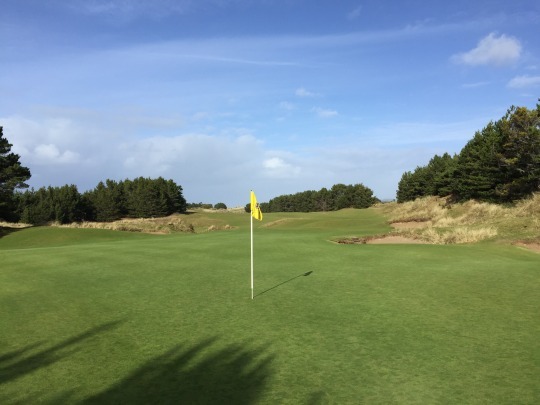 The course is in solid winter shape, with things showing a little greener because of so much rain this month. 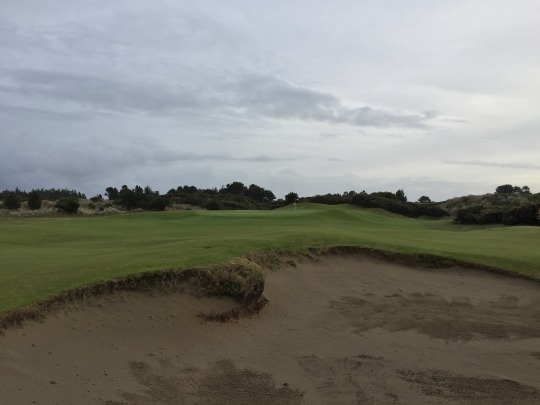 Otherwise, it’s typical nice Bandon style with the fescue turf that plays better than it looks and is always a little rough around the edges as intended here. Good tee boxes, tight fairways that were a little softer underneath than normal and good greens. The greens always look spotty, but they roll smooth and true at medium speeds. The bunkers had good sand, but the extra moisture made them very tough and compacted in areas. A few were even flooded, which shows how much rain there’s been on a course that is built to drain so well. It’s been a number of years since I first played Pacific and I’ve played all the other courses there in the years since. I had forgotten just how great it was. 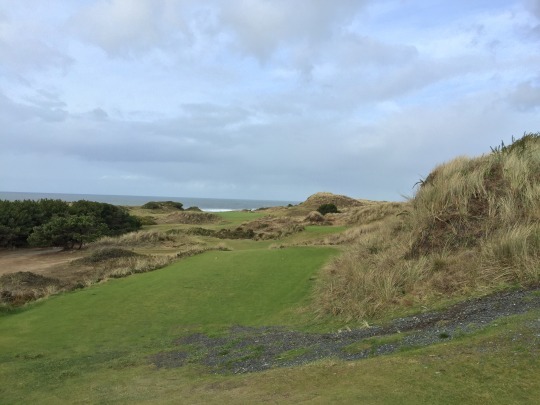 I generally have ranked Bandon Trails as my favorite course at the resort, but that may change back to Pacific Dunes. That said, it seems to depend on which course I played most recently. 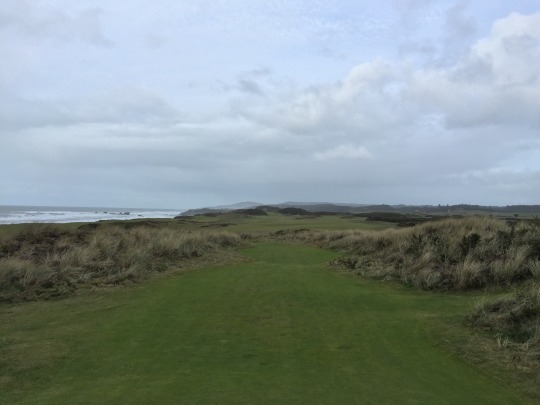 In fact, I walked off of Bandon Preserve thinking that might actually be my new favorite. I still put Old Macdonald a notch or two below the rest. That one didn’t quite enthrall me as much, but who knows? If I played it again, I reserve the right to change my opinion. 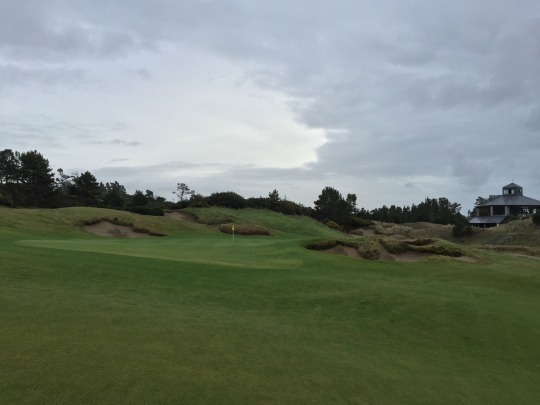 However you rank the courses, the entire experience at Bandon Dunes is so unique and memorable. I tend to take it for granted because my hometown is just a couple hours away and I go up there when visiting family in the area (usually in the winter when the rates are better and the weather is even more unpredictable). 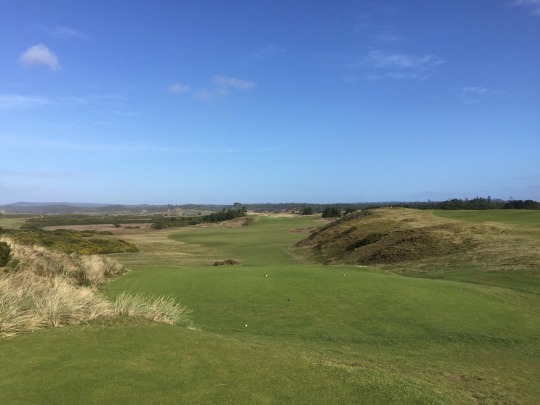 Sunday’s time there refueled my appreciation for the property and I wouldn’t hesitate recommending the “bucket list” Bandon trip if you are considering it. Now, would I choose it over a Pebble Beach trip? Probably not, but it’s apples and oranges—and both are delicious!